Paul Revere (1735 – 1818) was an American patriot best known for riding on a borrowed horse from Boston to Lexington on April 18, 1775 to warn the colonists of approaching British troops. The next day, when the British arrived in Lexington, the colonial minutemen were waiting for them. "I, Paul Revere, of Boston, in the colony of the Massachusetts Bay in New England; of lawful age, do testify and say; that I was sent for by Dr. Joseph Warren, of said Boston, on the evening of the 18th of April, about 10 o'clock ..." Read about the events of April 18, 1775 as written by Revere himself. The colonial language can be a bit difficult to follow, but as you read this, consider how Revere's account of that night differs from the famous Longfellow poem. 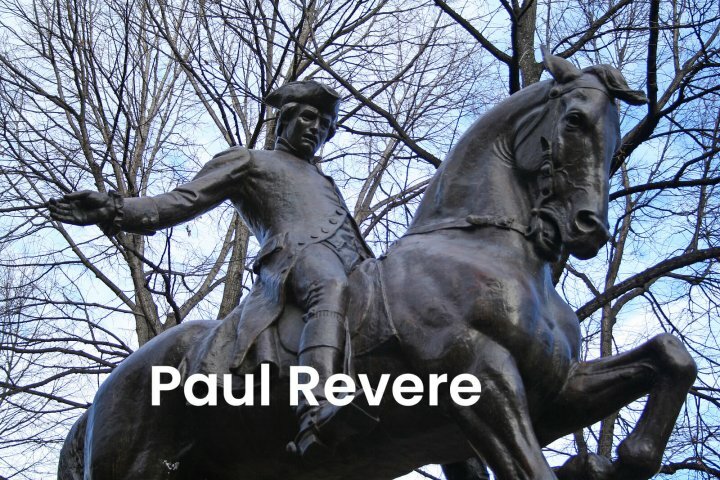 Learn how Revere came to be involved with the Loyal Nine, and the Sons of Liberty, and the role he played in the revolution beyond his famous Midnight Rider. "In August of 1765, Paul Revere participated in the Stamp Act Riots in response to the impending Stamp Act that was to take effect in the coming months. During these riots, the mob tore down the houses of government officials, including the house of Lieutenant Governor and Chief Justice Thomas Hutchinson." This virtual museum and Teacher's Guide was created by fifth-grade teacher Kimberly Hamilton more than ten years ago. So, although the site navigation feels a bit dated, the content is still first rate! The exhibits are divided into five halls, each with an offline activity or two. Start with Paul Revere's Ride (Exhibit Hall 1) and pass through The REAL Story, Colonial Boston, Ride with Paul Revere and Music of the Revolutionary War. Suggested class activities include reading Longfellow's poem aloud, making a paper model of the Revere House, and writing new lyrics to Yankee Doodle or God Save the King. Created by the Boston University Graduate History Club, the Paul Revere Project is a "resource that combines both basic facts and in-depth research about the famous Boston silversmith." Their goal was to be both interesting to beginners, and useful for those wanting to explore Paul Revere in more depth. Categories include Midnight Ride, Documents, Just Facts and Popular Myths. For example, did you know that Paul Revere was not alone on his Midnight Ride of fame? He was accompanied by two other colonists: William Dawes and Samuel Prescott. Paul Revere's small wooden home in Boston's North End is one of the city's oldest buildings. This National Landmark site is my pick of the day because it includes photos of the house, a Revere biography, and lots of details about Revere's famous ride. The best clicks, however, are in Just for Kids. They include a printable Paul Revere crossword puzzle, ideas for classroom activities, and a colonial-era recipe for dried apple snacks. Feldman, Barbara. "Paul Revere." Surfnetkids. Feldman Publishing. 16 Apr. 2019. Web. 19 Apr. 2019. <https://www.surfnetkids.com/resources/paul-revere/ >. By Barbara J. Feldman. Originally published April 16, 2019. Last modified April 16, 2019.